We Bring Great News to All! His desire is that you will turn to Him so He can save you. 2) We have all sinned. God is Holy and Perfectly Just. He cannot ignore our sins or sweep them under the rug. All of us have lied, stolen, cheated, been selfish, lusted, coveted and much more numerous times. 3) Sin leads to death and punishment. 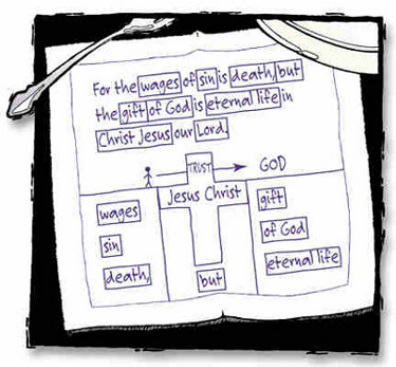 4) In mercy and grace God paid for our sins in full to save us from the penalty of sin. He offers the free gift of forgiveness, righteousness and salvation to all who believe. 5) Jesus came to proclaim the Gospel (Good News) that the sins of all who believe are forgiven in him. 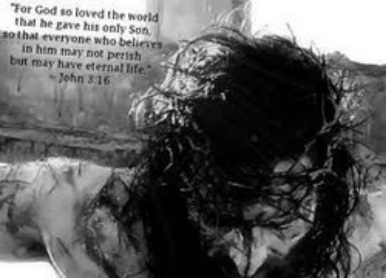 He did not come to count or hold our sins against us. 7) This is God's promise to those who believe, trust in Jesus. Does God Send People to Hell Just Because They Do Not Believe? ​Free in Hindi, Spanish, Portuguese, Arabic, Ukranian, Japanese, and Russian HERE. Click HERE for a simple gospel message in over 100 languages. ACCEPT JESUS, FORGIVENESS AND ETERNAL LIFE TODAY! I ACCEPT JESUS, FORGIVENESS & ETERNAL LIFE! Read here if you accepted Jesus as your Lord and Savior. Welcome to the family of God. This is not the end but the beginning. Now that you have been justified, declared righteous before God by your faith in Jesus, your exciting journey has just begun. You have crossed over from death to life. Now to grow in your new faith and experience all that God wants you to have.Make time to read the Bible (God's love letter to you) and take time for God, renewing your mind. Get involved with some other true believers. If you do this you will see your life change dramatically as the power and love of God fills your life and overflows to those around you. Addictions, depression, fear, worry and insecurity will all melt away when you know and really believe how much God loves you. We highly recommend that you GO HERE and take our 30 day challenge. Review our site and utilize the free tools NEW BELIEVERS RESOURCES to learn more about your new faith. Based on THE EVIDENCE there is no belief more reasonable. Learning the facts will show you how little faith you really need to believe and give you great faith at the same time. 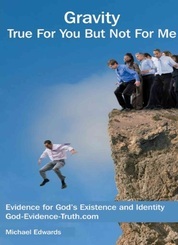 One very easy way to review the evidence for Gods existence and identity is to read a free book we have written entitled: Gravity - True For Your But Not For Me. Need an online church until you can find the right one in your area? Try The Vineyard or New Hope. Both offer sermons on video and live sermons of their services on Facebook. Vineyard - Streaming live on Facebook Wednesday at 7 pm, Saturday at 7pm, Sunday at 8, 9:30 and 11 am. Read here if you still have questions before you can decide. If you still have questions before you make your decision. Take the time to review our site. Christianity has never been based on blind faith. From the very start through today, the factual evidence clearly demonstrates that there is no belief more reasonable. Here are some tips to make finding what you need on our site easier. 1) If you do not truthfully understand why you need Jesus, why you need a savior, we can help. GO HERE and take a simple test found under "Wake Up Call". Just like a diagnosis of a deadly disease will compel you to seek a cure, understanding the correct diagnosis of your moral condition before God, will compel you to seek the solution. 2) If you have questions about God. We have much information about the evidence for Christianity on our site. We have also written a book for skeptics and believers. "Gravity" goes over the overwhelming evidence for Gods existence and identity. It has had some great reader reviews and is an easy way to examine an overview of the facts, and it is free. Read Gravity - True For Your But Not For Me. IDENTITY AND HOW TO GROW AS A NEW BELIEVER.